In October I was given a large glass vase. It is almost a complete sphere with a small opening on top. When I first saw the vase, ideas started popping up and swimming in my brain. I’m addicted to Pinterest and have seen the terrariums all over the site. The shady miniature landscaping caught my eye immediately. What you could do with some moss from outside, a few tools and some miniature figures was outstanding. I had recently seen a terrarium that had a graveyard and a grim reaper and thought of doing something similar in this large vase, which seemed appropriate for the Halloween season. Unfortunately time got away from me and the vase got forgotten in a corner. A few weeks ago in a fit of cleaning I found a large bag of fake moss. I had been planning on giving it to an old DM for table decorations, but never was able to get it to him. I had put it storage and forgotten about it. When I found it again, my thoughts went back to the big vase that I’d had hiding in a corner all these months. Today, inspiration struck. I have a small kit I got off of Etsy called “This Land” based off the famous lines from Wash in the cockpit of Serenity (I tried to find the kit, but I am unable. If you see it please link it in the comments). The dinosaurs and trees have resided in an old beta fish tank with gravel and a dinosaur plant I got from Think Geek. I have long thought about to moving the scene to another medium, but hadn’t worked out any specifics. So today (after much exposition), I took all of this and put it together! 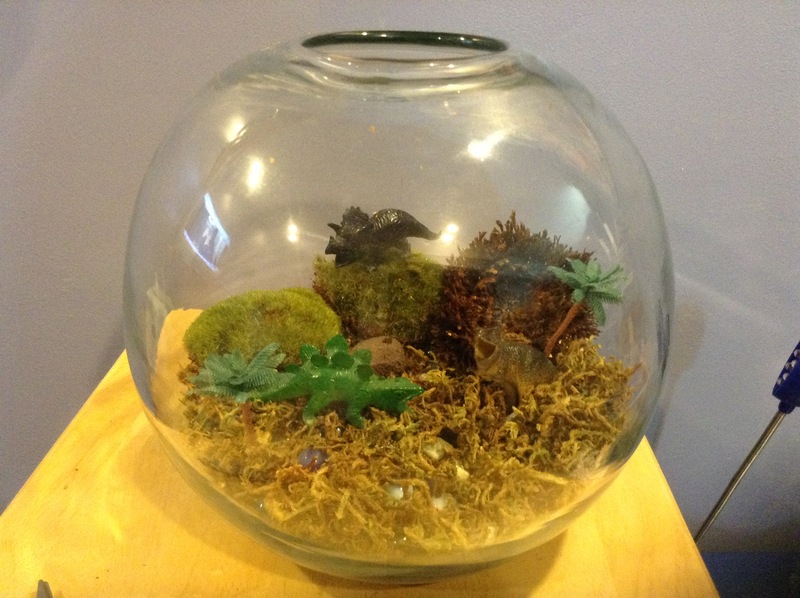 Moss terrariums are fun and a great test of creativity. A clear glass or plastic vase or bowl. You’ll want the container to be smooth and have an opening large enough to work with. Marbles, river rock, beads, or glass gems for your base. Fake or dead moss (you can get this from your local craft store, online, or the Dollar Store). Decorations for the terrarium. This can be toys, dollhouse furniture, or even Legos. It all depends on what you want to create! First you’ll need to clean your container, since we’re not using real moss, no worries about chemicals harming the plants. Just make sure its not dusty or cloudy. Carefully add your base to the container. Finally a use for my marbles! Then add your fake moss and your scenery. Moss from the dollar store and moss balls from Jo-Ann’s. Plastic palm trees repurposed from another project. Add your dino and/or non-dino decorations. Lovely tribute to my favorite pilot. It’s just that easy to create something really fun! I think this will look great in my cube at work. A little slice of Jurassic paradise.